Kevin talks about sports that he enjoys watching, and shows marked improvement in severe brain injury cognitive recovery. We wonder if high interest activities could help with TBI recovery. Many times during the interview, Kevin’s impairment in speech, memory, and insight were noticeable. Yet our perception of his cognitive functioning changed when the interview shifted to talking about sports, particularly of his two favorite Chicago teams, the White Sox and the Bears. This noticeable difference made me wonder whether using a survivor’s interest in being a fan could aid in severe brain injury cognitive recovery. 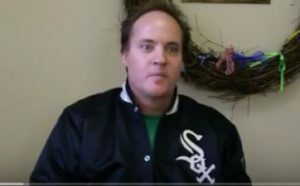 Kevin wore his White Sox jacket during the interview. He was an avid sports fan before he was hurt. He now has more time for sports now that he is not working. The day of the interview was April 5, 2011, the day after Connecticut defeated Butler to win the man’s NCAA basketball championship. He had watched the basketball game the night before. He was rooting for Butler, but explained that Butler lost because their shots didn’t go in. He theorized that they got too tense, pointing out they played a better game last year. He was also a University of Wisconsin Badgers fan. He wanted Butler to win because then the Badgers would have at least lost to the champions. Butler had eliminated the University of Wisconsin in a previous game. Kevin was accurate in his assessment of the basketball game. Butler shot the worst of any team in NCAA Championship history. Butler had been the runner-up of a much better game the year before against Duke, that was decided on the final shot. We started to talk about his memory in general. He admitted to having problems with forgetfulness. He said that he when he starts saying a thought, he will forget it. This is called short-term memory. He said that this frustrates him significantly. It happens a couple of times a day. Dealing with this challenge is part of his severe brain injury cognitive recovery. Although general memory was difficult sometimes, his memory for the game the night before the interview was very good. He admitted to being a Chicago Bears fan, not a Packers fan. The Green Bay Packers and Chicago Bears are geographic neighbors and perhaps the bitterest and longest running rivals in professional sports. Last year’s season ended for the Bears when they were beaten in Chicago by the Packers in the NFC Championship Game. The Packers went on to win the Super Bowl. Kevin is from Janesville, WI, near the Wisconsin/Illinois line, one of the only places where there may be some significant numbers of Bears fans in the Wisconsin region. We talked about the game. It was clear that Kevin still has some of his sense of humor intact. He laughed, catching the sarcasm of a Packer fan ribbing the Bears. He in the same tone said that there was an illegal hit that caused the Bears to lose. He then told the story of growing up with the Rockford channels instead of the Madison channels. He was about thirty miles from the Illinois-Wisconsin border. Sometimes he would flip between channels alternating between Bears and Packers. He would choose which one had better uniforms or better players. When Kevin was a young kid, the Bears were the better team. He mentioned that the Bears were a better team when Mike Ditka was playing or coaching. “Those were the days,” he said. I included much of the seemingly irrelevant conversation about sports because Kevin showed impeccable memory and analytical skills in talking about the games. I would like to see more research done focusing on “spectating based cognitive therapy,” where people use intense interest in sports or some other activity to help them get through tough times like that of brain injury. It is possible that high interest activities like watching sports aids in severe brain injury cognitive recovery. See our next post about spectating based cognitive therapy.